I read “Lilac Girls” in 2 days. Until 5:00 AM. Could not put it down. Will recommend it to my book club(s). Am delighted that war crimes folks have been taken care of. My father, in the U. S. army was at the Bulge where the Americans white-washed their tanks to blend in with snow. Also they cut the bottoms out of their sleeping bags ’cause it was sssssooooo cold. Thank you for your lovely note, Harriet. I’m so glad you enjoyed Lilac Girls. ? Once I started reading Lilac Girls, I couldn’t put it down. As I read it I experienced so many emotions…joy, sadness, anger. What happened to the women in the concentration camp was so terrible and it is hard to understand why those who operated on them weren’t punished more severely. Your book is riveting and amazing! Thank you for your lovely note, Linda. Im so glad you enjoyed Lilac Girls! And yes, I agree it’s hard to understand why some of the doctors and others got off easily. I think it had a lot to do with the US trying to curry favor with Germany at the time. I have just finished reading Lilac Girls – thank you! I’ve always thought that women could stop the global carnage if we could just hold hands somehow. Love this comment, Yvonne. I 100% agree! Read this book if you think women are different from men. Kompisch concludes: ‘The fact is that women allowed their female characteristics to be suppressed to bind themselves to the Nazi state and its agencies. ‘To say, as most did at the end of the war, that they knew nothing of the terror and torture is absolutely unbelievable. They supported and underwrote such terror and torture. You’re a fantastic author, and I can not wait to read the prequel to Lilac Girls. I simply could not put this book down. As a young 21 year old woman, I’ve always been fascinated and by the holocaust. I am glad you brought up the “Rabbits” and the “sulfa experiments” because I always was interested in what kind of horrible things happened to them. I never learned about the sulfa experiments so I am glad to have learned about them. I knew about Doctor Mengele but not about Herta so I am glad you mentioned her in this book. It was very sad these girls had to go through these tortures and live out their lives with the horrible memories of being in that concentration camp. However, I think it was a beautiful idea to name the title Lilac Girls, because you are right a lilac does blossom after a harsh winter, and these women did go on to blossom too after being a prisoner in that camp. I am a varacious reader, and I’m really ecstatic to know you’re writing a prequel. I hope you never stop writing. I myself would like to write a book one day too. I write poetry, but I’d love to write a novel one day. Thank you for writing this book and for being so brave to bring up a topic people seem to ignore now a days. It is awfully sad how people are so ignorant to what happened during the holocaust and how they believed it never happened. Anyways, please continue to write. I look forward to reading your next work. What a lovely note, Jenny. I’m so glad you enjoyed Lilac Girls. You should take a shot at a novel–it’s a wonderful experience! ? I loved reading Lilac Girls. Was hard to put down and will recommend to my book club. I cannot understand how another human being could be so in humane to another, especially as a female doctor. Wanted to understand Dr. Herta’s state of mind. I thoroughly enjoyed reading it. So happy you enjoyed it, Amy! With everything happening in America right now, I feel the need to study history to stop its repetition. It is unfathomable that people can be so heartless and cruel although there continues to be too many examples even today. Amazing book that motivates me to do more positive in the world. You are so right, Kelli. Thank you for this. It makes me so happy the book has spurred you toward positive change. I think Caroline would be proud. Who said,’lest we learn from history, we’ll likely repeat it’? Wow, you’re a fast reader, Shannon. I’m so happy you liked it! I have visited the Holocaust Museum in Washington, D.C. a couple of times and am now wondering, after reading your book, if Caroline Ferriday is featured in any of the exhibits. There is so much to see, read, and watch there that even after two visits in two years, I know I have not yet seen it all. Thank you for sharing the stories of the survivors so beautifully. No, Caroline is not featured at the museum, but she has an archive there. And thank you for your nice note! This was an incredible, moving book! I did not realize it was a true story until after I finished it. This is one of those rare books that you want to sit and savor after you finish it. Great read! I loved the book and mainly read it to see how Poland was represented in the story. I wonder why you chose to call Polish mom…Matka instead of Mama or Mamusia? Matka sounds so formal. Also, where the name Pietrik come from? Regardless, I loved the story line and that you told the story of Caroline and the Polish ladies who suffered through so much. Now I know Matka is formal, but at the time I didn’t know…and I found Pietrik in an old Polish book from the 40s.I’m so glad you enjoyed it! I absolutely loved this book. I have a long commute to work so I love listening to books. Listening to the book felt like I was there. I actually missed my exit a couple of times. It was thought provoking and touched my heart. Thank you! I love that you missed your exit. The best recommendation for a book ever! So glad you enjoyed it, Diane. Disgusts me that so many nazi doctors and other officers basically went free. What became of Herta’s life after she could no longer practice, until her death, much too late, in 1978? Was she ever sued by survivors? Would that have even been possible? Hera lived a quiet life after her medical license was revoked. The rabbits never sued her but they did get reparation from the German government. How did you come up with the title The Lilac Girls? Hi Wendy, The publisher came up with it…they liked the idea that lilacs only bloom after a very cold winter, just like the girls. Noting the times, I see I am among others who savored Lilac Girls, having read into the early hours. Thank you for a wonderful novel honoring these brave women, and for giving the inspirational Caroline to the next generations. And not a moment too soon, as I agree with previous comments about the current political climate. Let us all benefit from Caroline’s tenacity and bravery as we guard against hatred. I look forward to the reactions from my book group. I would like to know what title you would have given the book had the publisher not opted for Lilac Girls. Personally, I would prefer that they’d be given the respect due them by calling them women. What are you writing about now? I’m happy you enjoyed Lilac Girls, Patricia. I’m working on the prequel, Gin Lane now. Absolutely loved this book! So true to history and a definite page turner! I found my self holding my breath…as I read on! So happy you enjoyed it, Gretchen! My wife got the book on the basis of someone else’s recommendation and after she read it she asked me if I was interested. I asked if it was a “girly” book she said to take a look and see if I was interested. Wow! As a grandson of Polish immigrants on my fathers side and married to Janina (a name featured in your book) I couldn’t help but wonder what our unknown relatives went through during those horrible years of both Hitler and the Soviets. Your book was an excellent read and caused many a tight throat and watery eyes. You brought to light not only a terrible event for many Polish families, but also the courage and determination of the human spirit. I’m always so happy to hear from people of Polish decent that it resonated with them! I met you last week at your presentation in Libertyville, IL. Bought the book that evening and devoured it over the weekend. I cannot remember the last time a book consumed me so! Parts were so difficult to read as the horror imposed on fellow humans is unimaginable – but the resilience and strength of these women from Ravensbruck was nothing short of inspiring. I’m so glad you enjoyed the book, Lee! One of the Polish girls did stay with Caroline and married here, but not one of the sisters. Nina Ivanska lived the rest of her life in Paris and worked as a journalist. Sadly, her sister Krystyna passed away from her cancer. I found Lilac Girls at a local bookstore and I am so glad I picked it up. I couldn’t put it down. Never have I been so moved by a story. You’ve captured the resilience of the human spirit, the complexity of love, as well as the tormented emotions of people who have lived through the worst imaginable situations. Thank you for bringing the story of the “Rabbits” to life. Their story was largely unknown to most. This was the perfect time to read it. Thank you, Daria. What a beautiful comment!? I found your riveting book in a rental condo in south-west Florida and echo the sentiments of others : ” I could not put it down.” Beautifully written and structured , with such suspense. I love the fictional account which weaves its way through the true story. Cannot wait for your next book. Any vague idea when it might be published ? Hi Joey, So glad someone left it there for you! Next book, a prequel is due out next spring.? Just read this book – it was extremely well written, gripping and disturbing! I started it at 900am on Saturday morning and finished it at 930pm that night – I did take a break for supper. Thank you Martha Hall Kelly for the intensive research. I am of Polish descent and found the portrayal of the “Rabbits”, the strength of these women inspiring, but hated the horrific atrocities they had to suffer. I admire Caroline Ferriday for her dedication and achievements. Because of your book I am doing research and further investigation myself – this has opened my eyes to the gruesomeness of this war. Wow, that’s amazing, Stephanie! I’m just thrilled you connected so strongly with the book! ? Thank you for writing such a moving book. I read it on 2 days. We have to be so careful we don’t repeat the past. The world we live in as the essence of what took place back then. We can never forget. Your book reminds us how fast people can turn from good to evil. God bless all who survived and their families and of course those who didn’t. God bless Caroline and those like her. They are Angels on Earth. Thank you again for the book I will certainly recommend it. Wow, you are a fast reader, Margaret! I’m so glad you enjoyed it and so agree Caroline was an angel! I read a lot of non-fiction and historic fiction about WWII. I think part of my interest is in the mystery that so many people were convinced it was okay to treat other humans in such horrific ways. I just finished Lilac Girls; the first book chosen by our newly formed book club – can’t wait for our first meeting this week. What a well written, compelling book. Hard to read but hard to put down. Thank you for the heart and soul you put into Lilac Girls. Thank you for your lovely note, Donna. Honored to be one of your newly-formed book club’s books! If you get a chance could you take a picture of your club and send it to me here on the contact at the website? I have a little gallery of bookclub pics and would love to include you all. I deeply enjoyed reading your novel. Definitely up there in my favourite Holocaust fiction! On a side note, I have a German friend who is the spitting image of Herta Oberheuser (at least in the photo in this post). I nearly flipped when I saw that photo. Not sure if that is something she’d like to hear though so I’ll keep that here. So glad you enjoyed it, Fran! Hopefully your friend won’t read this, but how strange is that? This was a really fantastic book – I read it in two days, and particularly appreciated the info you provided in these web posts on the characters, locations, and other information mentioned in the book. 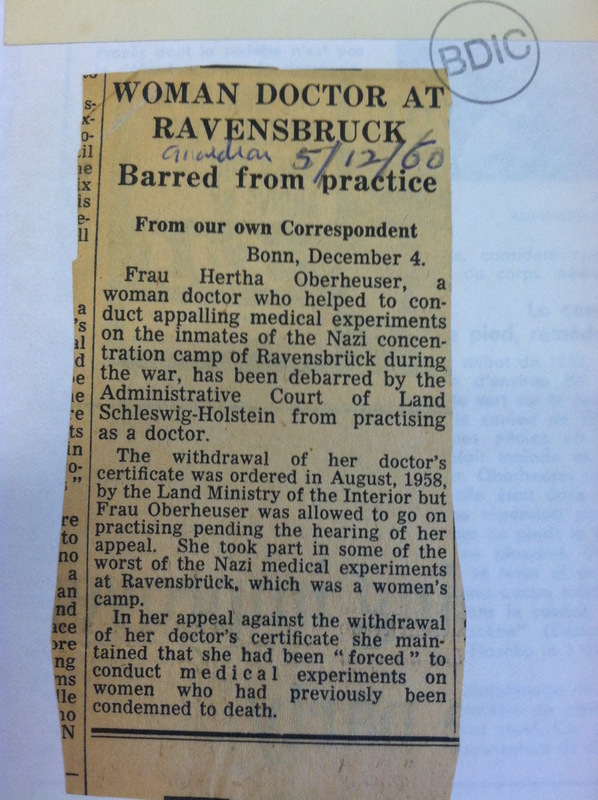 Do you have any links to what happened to Herta Oberheuser after she lost her appeal to practice medicine in Germany. I’ve tried to hunt it down, but no luck yet. So glad you enjoyed it, Margie! There isn’t a lot written about Herta–after her medical license was revoked she lived a quiet life, never married. Fritz Fischer worked for a chemical company in Germany and kept his medical license for life. I am another reader who couldn’t put this down – was up until 2am and then took the afternoon off of work to finish it. My heart breaks for these women…. All of them. This book was amazing. My book club will be discussing it tomorrow night and I can’t wait to hear their thoughts! I want to learn all I can about the Rabbits. What a tragedy. In addition to reading this for myself, I am currently reading Milkweed by Jerry Spinelli to my sixth grade students. I’ve been sharing snippets of things I learned from your book with them. This book so touched my heart. My Dad was a first generation Polish American. I am half Polish and a quarter German on my Mom’s side. Growing up in the ’60’s, WWII was still fresh in many ways. Anne Frank was my heroine as a girl. When I read about these Polish girls it gave me my adult heriones. I remembered my tough Polish Grandma and aunts and I know Kasia and the rest of them by heart. Thank you, thank you. Anne Frank was my heroine as well, Peggy. Thank you for sharing a bit of your Polish family–I’m glad Kasia rang true for you. I read the “Diary of Anne Frank” as a young teenager. My love for her, and the horror of the atrocities visited on her, and so many millions of other victims of the Nazis, opened up a whole new world of interest for me, along with a strong sympathy for the Jewish desire to create the new Israel. In the ensuing years I read many books supporting their cause, and about Jewish culture. One of my early goals was to go to Israel to spend a year on a kibbutz, however, I met my now American husband, and came to America (from Australia, in 1970) instead. Last year I finally got to Amsterdam and visited Anne’s attic home. I was most affected by her bedroom, where she was brought to life for me. It was so very difficult to leave that room. I have tears in my eyes as I write, remembering the experience. I was drawn to your book after reading “The Nightingale.” I had long since given up reading about Nazi and Soviet Russian atrocities, because of the grief they caused me. It was hard to put your book down. I was thankful for the interjection of Caroline’s story between the sad chapters of the other girl’s stories……I needed that break. I must admit however, that sometimes I could not wait to read about the outcome of a scene and skipped a chapter, to return to it later. Thank you for this compellingly readable and eye opening book. Although I had long ago read about the Nazi experiments, I had not known about the “Rabbits.” We must never, ever, forget what evil humankind is capable of, and must fight against it whenever and wherever it surfaces. I agree, Wendy—Anne Frank’s House was life changing—especially her bedroom. I’m glad you ended up reading Lilac Girls…thank you for reaching out with your kind thought. Much appreciated! Absolutely loved this book and like others could not put it down. Like most people, I am familiar with the Holocaust and the murder of 6 million Jews. However, I was not familiar with the story of the Polish women and their suffering at Ravensbruck and it opened my eyes to learn more about the atrocities of the Nazis and how far reaching their diabolical fingers stretched. So much evil, so much hate and so much sorrow. Thank you for writing this most powerful story. I so agree, Rebecca. I have a little pin I wear that says “remember” in Hebrew and it reminds me every day. I just finished the Lilac Girls. I am still teary-eyed after finishing the book. A great book that I will recommend to all. I had never heard of the Rabbits nor Ravensbruck. Now I can’t stop looking it up and reading more. Thank you! I’m just thrilled you enjoyed the book, Heather. If you haven’t checked out Pinterest, there are some great photos of Caroline on my page and others. I have just finished reading Lilac Girls and have come away feeling so moved. I sort of feel like I’ve been on an emotional roller coaster! Couldn’t help but feel happy, angry and sad at different times throughout the novel. Such a wonderful story. I was so happy to read that Caroline Ferriday is a real person, what an inspirational woman! I can’t wait to find out more about her. I have already seen some beautiful pictures of her on Pinterest. Thank you for such a wonderful book! Thank you for your extensive and relentless research into writing Lilac Girls. The story has stayed with me and occupies my thoughts daily. I am an avid reader of World War II historical fiction and this book did not disappoint. My interest is most likely due to how the war affected the lives of my parents. My mother worked in her local post office and has many fascinating stories about war correspondence and handling of mail during the war years. My father served toward the end of the war in 1945. While growing up, whenever I would try to engage him in conversation about his service, he would speak very little about his division’s activities in Germany, Italy and France. Recently in going through a box that was hidden away in our attic, I came across his war memorabilia– newspaper clippings, maps and troop reports describing movements of his division. From what I could piece together, his unit had involvement with liberating and witnessing the aftermath in one or several of the camps. From finding this information, I can understand my father’s reluctance to discuss his experiences. I’m sure he kept these disturbing memories hidden away as deeply as possible. Your book has captured the spirit of all things horrific yet triumphant during this important time in history. Thank you again! You are so welcome, Judy. Thank you for sharing a little piece of your family history! I just finished the book and have so many emotions and thoughts about it. I read a lot of historical fiction and have studied a lot of about the Holocaust as some of my family were European Jews who were killed in the Holocaust. I knew that people were experimented on in the concentration camps but I didn’t specifically know about the Rabbits. Having knowledge about the atrocities is different from reading a first person description of the suffering. You did an amazing job of bringing a voice to the Rabbits and I will never forget their voices. 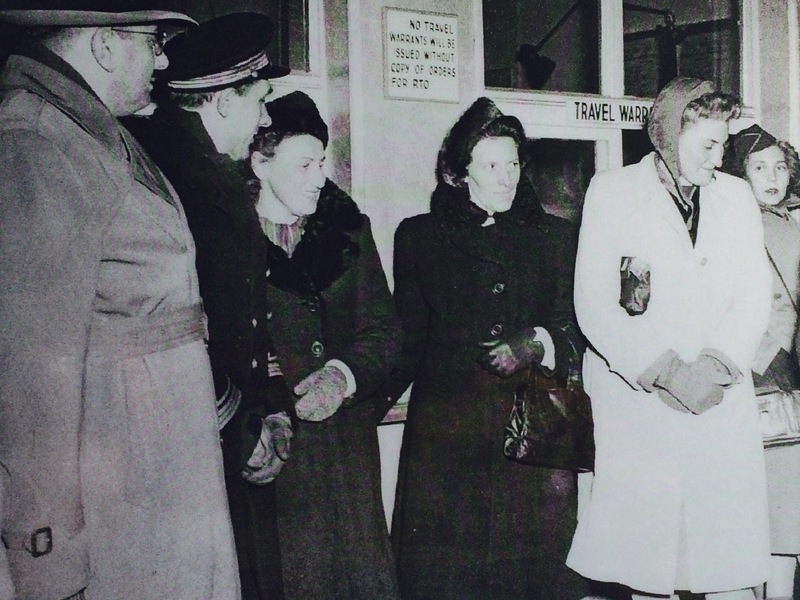 Thank you for also bringing Caroline Ferriday’s story to light – what a remarkable woman. I think the Lilac Girls would be amazing as a mini series – you should try to get HBO to produce it. I think it’s important for as many people as possible to learn these stories – now more than ever as there are so few survivors left. Thank you for your lovely note, Shonna. You are so welcome! 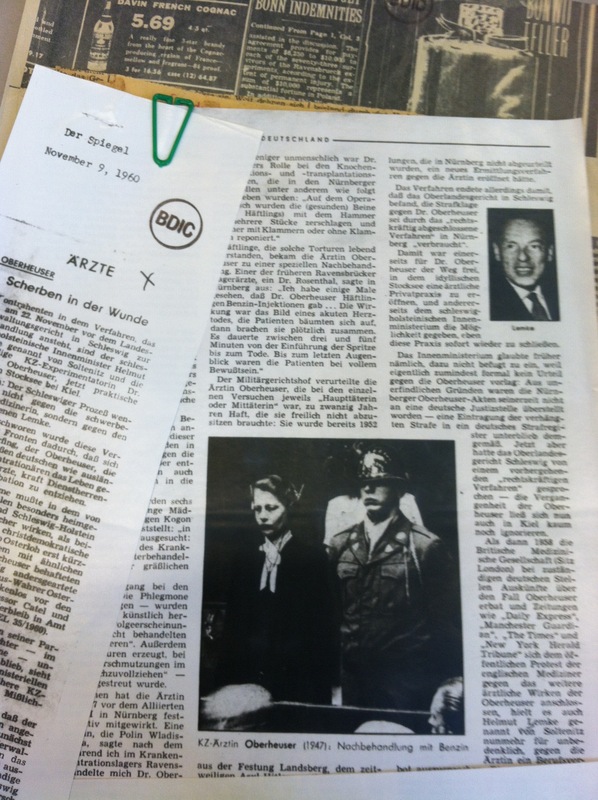 Dear Martha…having grown up in Postwar Europe…I have studied, and continue to study, the Holocaust intensively. Although your novel is considered fictional…the portrayal of the actual historical figures are exceptionally well done…and accurate..which is important to us historians. Moreover the detailed description of the evil deeds of those female guards in Ravensbrueck and the work of Dr.Herta Oberheuser is very valuable to today’s generation, who stands in great danger to no longer be taught what happened…many young people just seem to think that the Third Reich was kind of a bit of a tough time…they have zero clue of what actually took place in those camps. 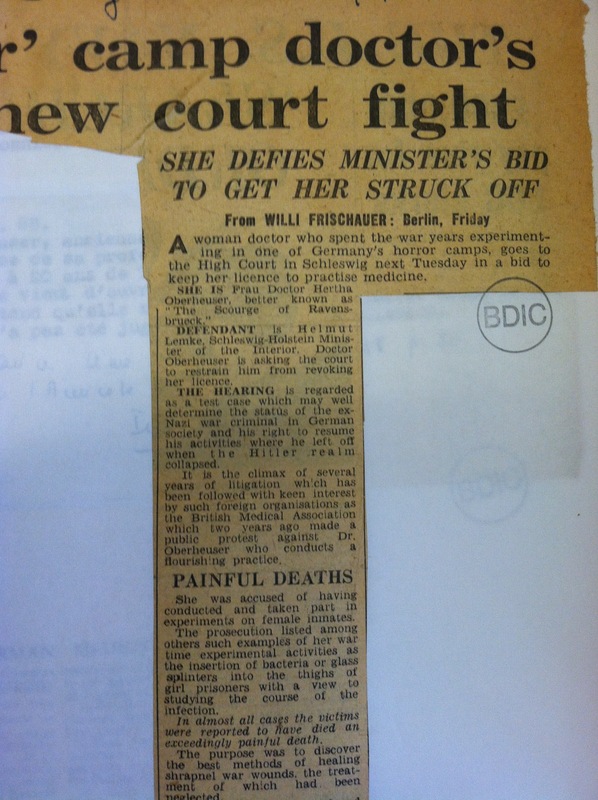 Personally; I feel this “doctor” and all of her ilk were not treated correctly by the victorious Allies. She should never…EVER…have been released from prison after serving only five years…for her “good behavior”. It was a sheer travesty of justice. I do feel, based on history as well as personal research, Germany never really acknowledged its guilt, nor did it repent, as did other countries who were heavily involved into the extermination of 11 million people, and countless civilians, murdered for helping…the treatment the Jewish survivors received when they returned to their respective homelands, was almost akin to the Nazis. Failing to mete out justice…and failing to repent…and failing to make reparations causes the one thing we can always count on…and that is history repeating itself. When we look at what is happening to those European countries who assisted the Third Reich today…it seems to be what the Bible would call “The Sins of the Fathers shall be revenged upon Seven Generations”. I am looking forward to your prequel…and congratulate you on a superb work! If my comment is accepted…I beg you to correct that sentence for me…thank you! Thank you for your wonderful comment. I tried to approve and then edit your original comment but WordPress does not allow me to edit the comments. If you want to send me the edited one, I will just delete the originals. I read your book on a cross country flight. It was hard to put down! I only wish I had brought tissue with me. I admire the strength of the of these women. It would be difficult to accept that Herta was not given a harsher penalty or put to death…..she, I’m sure, received her judgement upon her death. Thank you, Tasha. Yes, I agree. I was bored at the airport and came across Lilac Girls at the airport newstand. I don’t really read a lot and normally by ebooks but something told me a I needed this book. I am about halfway through and wow. I am so glad I bought it. It is so hard to read but very eye opening. I cant wait to finish it. So glad you’re enjoying it, Brandy! Thank you for your comment,Karen.? I was browsing through chapters one day when I came across your novel Lilac Girls. I found it to be incredibly captivating and was quite emotional throughout the read. Throughout reading the novel I felt compelled to further research parts of the story as I had never heard of these events before, I was hooked throughout the entire book! I especially liked the use of the different points of view and I think all 3 of them really added a unique perspective to the story. Thank you, Nicole. I’m so happy the book compelled you to do additional research. Fascinating isn’t it? I don’t believe you can say you enjoyed a book such as this. Much as with Babi Yar or Treblinka you are enthralled, disgusted, gut-wrenched, sickened, horrified, etc… and I could not put it down. What incredible women. When you read a page and then have to put the book aside to reflect I what you just read, because the truth is impossible to conceive, that is impactful. Well done. Your development of Kasia’s character was brilliant. I read lilac girl in 2 days. I simply could not put it down. I am a huge fan of historical fiction based on true events/characters, so this was right up my alley. I loved experiencing the different perceptions of each character’s viewpoint. I equally loved the juxtaposition of Caroline’s “luxurious” lifestyle alongside Kasia’s. it made Kasia’s experience so raw and honest. I genuinely felt like I was there with her. I cried, laughed, and yelled alongside all the characters, and it ended beautifully. The click of the compact was a perfect way to bring the story full circle. Thank you for taking a leap of faith and writing this story that has touched so many hearts. I have learned as much as I have enjoyed. I CANNOT WAIT to read the prequel. Wow, Kat, I’m so glad you enjoyed the book. I’m just finishing up my first draft for the prequel and notes like this make me even more excited to share it! I agree 100% with everything Kat said! I just finished the book and what an incredible story – I just had to write you! I took this book everywhere with me and could not put it down. I am also a huge fan of historical fiction, specifically for this WWII time period, and I thank you, along with the many others who have written to you, for sharing Caroline’s story, as well as the story of the women at Ravensbruck. If it was not for you, I would have never known of Caroline Ferriday and her courageous efforts to help these women or even the stories of the women at Ravensbruck. I thank you also for putting together this site, showcasing your travels and the research you have done so we can dive deeper. I read Grazyna’s poetry from the link you provided in your “Inspiration for the Novel” and it touched my heart. I could not even begin to imagine what those girls went through, but you depicted their spirits and courage beautifully through this novel. I also cried, laughed and yelled alongside the characters who you represented so well. You have inspired me to learn more and I will be reading your recommended books at the end of your note to continue the journey. I’m so glad you read Grazyna’s poetry, Vanessa. She was such a lovely woman. As a person who lived in Germany with during the 1960’s and having parents that wanted us to SEE history, you are spot on ! I wept,got angry and amazed at the courage and tenacity of these women ! I had a Polish friend that came to the US in the late 70’s and learned so much from her. Perhaps through your book we may hope not to allow history to repeat itself. We as women can accomplish so much. Thank you for writing this excellent book. You are so right, Bryony–we have to make sure history doesn’t repeat itself. How wonderful that you went to Ravensbruck! I have never taken the self-guided tour of the camp but I am very surprised there is no mention of the rabbits. But then again there were a lot of bizarre things that went on at that camp that probably didn’t make it to the tour. Stunned into silence when I finished reading the last sentence of Lilac Girls. Literally couldn’t move for 20 minutes as tears fell. Vivid, captivating, heartbreaking, sorrowful, colorful and intensely tangible … every page, beautifully written. Thank you for giving us this history lesson. It’s been a long time since I’ve googled so many terms with which I was unfamiliar…balalaika, twelve Polish Christmas dishes, Schiaparelli, Abraham Lincoln lilacs, tracht dress, Horn and Hardart Automats, Ravensbruck striped uniforms, BDM badges, Caroline Ferriday, Lublin Castle, the Hay … to name but a few. I learned much. I pray this book finds a wide audience so the many can learn of this slice of horrific yet courageous history. The power of life is overwhelming. Thank you, Sheri. I loved hearing all the things you Googled! I have just finished reading Lilac Girls, having read it on a cross-Atlantic flight. Having read all of the above comments, I can only agree with all the sentiments expressed. It is an amazing book that makes one question how someone like Herta could treat fellow human beings so horrifically, but also that others, having suffered so much at the Nazi’s hands, could forgive. I loved the book, even though many times it made for harrowing reading, and I will pass it to my daughter, who lives in Germany, to read. As far as Germans not feeling guilty for what happened during the war, when I visited Berlin, this was not the case, as everywhere I went, there were people (especially of my age – 65) who truly felt guilt at what their parents had done. Thank you for bringing to light what happened at Ravensbruck and I look forward to reading the prequel. Thank you for your interesting note, Dee and thanks for passing Lilac Girls on to your daughter. So glad you enjoyed the book. I have read a lot of books about the Holocaust. And I thought I knew so much. But I did not. Thankyou for such a powerful book. Seeing all of this thru three different views was very interesting. Especially the view of the Dr. I still do not know how any human could do such terrible things to others , but watching her convince herself this was OK was eye opening. Thankyou for an incredible book. And an intense history lesson. This is one of my favorite books of all time. Just finished ur novel Lilac Girls , u have now a fan. It would be & should be movie material. Did not want it to end. Wouldn’t that be wonderful, Salvatore? I just finished Lilac Girls. Like many other’s I began reading and could not put it down finishing it in two days. I had to know more. I took notes to research about this horrific act and all involved. Thank you for such a beautifully written book drawing us into the life’s of these courageous women and the fight to bring justice. So glad you enjoyed it, Beverly! I read it slowly, with tears only a chapter at time. Each chapter occupied my thoughts for day or two or three . This book deserved more than to read straight through. I just finished Lilac Girls as I was traveling through Europe for 3 weeks. I had the opportunity to visit a work camp in Prague and it was much more “real” as I had been reading your book. Thank you for painting such a realistic picture with your words of this horrific story. I know so many died and suffered but what an inspiration to see what the determination of a few individuals can do. I’m sure your book will inspire and encourage many to stand up and fight for what’s right! Much thanks and appreciation for your time and talent. Thank you for your lovely note, Wendy. This is the first book I have experienced on tape. I had a two day drive down the coast of California and wanted to “loose myself’ in a book Not only did I learn a whole new part of history from the telling of the story of Ravensbruck and the polish women who survived it, I also had a deeply “felt ” experience of these women.. Hearing the voices of 3 different narrators breathed life into this profound story of how women, from different parts of the world, experienced the reshaping of their lives and relationships through the trauma of war . Acutely painful at times, I was also stunned by the inhumanity that was inflicted by the medical personal and the level of disassociation that occurred as they justified their acts. Having the story move into the decade following the war gave the listener an experience of time and place of what it might be like to now find a way “to try to live” with the traumatic memories ..each in their own way..with their own wounds. We all experience our ability to endure and survive differently. The women in this book will always be with me. It is the shadows of life that can sometimes illuminate the most hope and resilience. Thank you for writing this incredible story. You are so welcome, Susan. I’m so glad Lilac Girls was your first audio book. I love listening to books on tape, too. They can really bring a book alive. I just finished reading Lilac Girls and it is now easily one of my favorite books. I’m so glad you gave life to this story that so desperately needed to be told. The book is an absolute page-turner and told with such literary beauty. Thank you for the dedicated research and travel you undertook in order to accurately depict these lives and the horrors the Rabbits endured. I am so happy to know of Caroline Ferriday and what a true hero she was. How kind of you, Shelley. Thank you for reaching out! Just today finished The Lilac Girls and really enjoyed it. I have read a number of books about this time period but this all – female Ravensbruck camp was new to me. I am so glad you told this story to us who did not know. It brings honor to these women. Also touching were your Author’s Notes. The places you visited, people you talked to, archives researched. Thank you again! 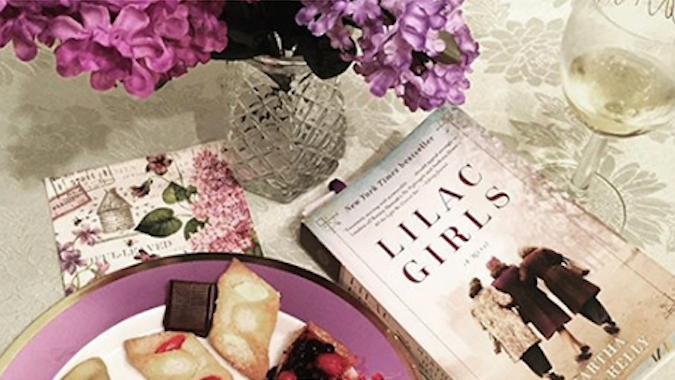 I read Lilac Girls a couple months ago and was riveted to it and so recommended it to the book club I belong to and I am happy to say we will be discussing it this afternoon. This book has been on my mind so very much since I read it, as did a good friend of mine and we have had many long talks about it. Thank you so very much for writing their stories. I look forward to reading more books by you. So brave and resilient and so confronting for the reader. I listened to the book on audio and it was riveting and full of many emotions for me annd quite likely the same for anyone who reads it. No one can deny these atrocities and congratulations for putting down the story in black and white for all to read. I started and finished Lilac Girls during a vacation about a week ago and it is now in my list of favorite books. Once I finished it I spent time looking into Caroline Ferriday, The Rabbits, and Herta Oberheuser. This story, that so desperately needed to be told, was heartbreakingly beautiful. I had many moments where I had to put the book down to gather my breath and thoughts before returning to it. Thank you so much for writing this book. I am recommending it to everyone I know who enjoys reading as much as I do. I’m actually in the middle of reading Lilac Girls. This story is so heartbreaking yet triumphant. Has Caroline Ferriday ever been nominated for a Nobel Peace Award? Like so many others, I just finished reading Lilac Girls. It brings tears to my eyes just thinking about it. Your book was so powerful. Your writing made the characters come to life. Then when I read your author notes, I was impressed at how much research you did to bring the story to life. I knew, of course about the experimenting, but not in detail. I did not know about Ravensbruck, or Carolyn, or so much of it. Your characters are so real, that I feel like I knew some of them. I am still having a lot of trouble understanding the change in Herta. I am sure it was cognitive-dissonance, but I can’t imagine making the life choices that she did. I just fervently hope that no one is in that position again. I am so happy that life eventually worked out for Kasia and her sister. Thanks to Carolyn who was an amazing woman. I am glad you have brought her story to life. Thank you for writing this story. I cannot wait for the prequel! As so many of the comments above note, this book was absolutely incredible from start to finish. I’m a prof in Genocide Studies, and so have read many books on the subject – but none as riveting as yours. You have done such an impressive job of narrating the story of these three women – I will be assigning this to students in the future, as I think reading stories like this is one of the best ways to truly understand the horrors of that time period. I just finished reading Lilac Girls. Someone picked it for our book club. At first I thought I didn’t want to read about the concentration camps, but then couldn’t put the book down. I had never heard of the “The Rabbits” or experiments they did on the women. What an eye opening story. It was so hard to believe Herta could do what she did. 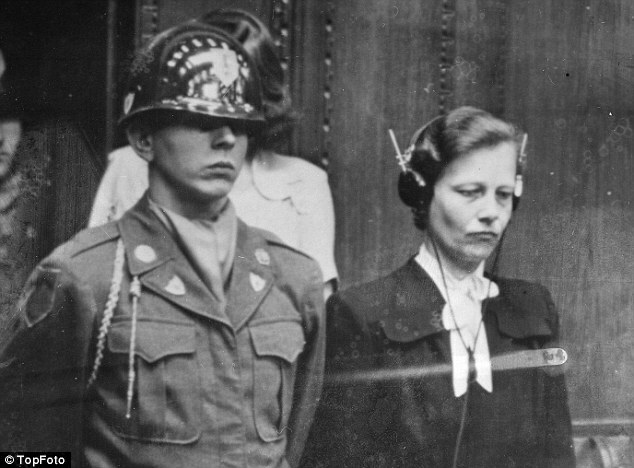 America was wrong to pardon her. I am glad her license was taken away. Thank you for researching all the information for this book and Caroline and her mother’s helping these women. I have devoted the last two days to Lilac Girls and my eyes won’t stop watering. I have a hard time getting my head around the atrocities that we, as human beings are capable of committing. Pray nothing like this ever happens again. Thank you Martha for such a beautiful and heart wrenching book. Thank you Martha for your outstanding book. We should never forget the horrible things people can do to each other, but also that their always will be people who are Lilac,s. Such a lovely sentiment, Rensake. Last year my wife and I visited Poland to meet up with our son and his wife who lived in Istanbul at the time. We had the honor and the opportunity to visit Auswitz and see first hand “man’s inhumanity to man”: a pile of women’s hair 4 feet high and 10 feet long; thousands of shoes, pots and pans and personal items. As our tour guide said “each pair of glasses, each comb represents a person who didn’t survive.” We listened to your wonderful book on CD and I didn’t realize until the end that Herta and Caroline were living people. Your author’s comments at the end were as moving as the book itself. It’s clear that the book had a profound affect on readers and the author as well. I’m so happy you enjoyed the book, Martin and thank you for sharing your own story. What a powerful read, especially for a first book !!! Loved it. Enlightened me as to what my Polish relatives actually lived through and found it hard to explain; what horror. I’m so glad Lilac Girls resonated with you, Barbara! I just finished Lilac Girls and I am at all with your book. I am an historical fiction reader and have read a zillion books from really famous authors but no one has your qualities when it comes to writing. I COULD NOT put this book down. You are the best writer I have ever read and I am not one to exaggerate. Please continue writing books. Your book was so fascinating to me. I look forward to your next great read! Also I just wanted you to know, I have never reached out to an author before, but you have really blown me away with your book. Thank you , thank you thank you. I really appreciate your lovely note, Sandra and I’m so happy you enjoyed Lilac Girls so thoroughly. As I bet you can tell it was a true labor of love and I’m having an incredible time writing the prequel now. Can’t wait to share it with passionate, caring readers like you. I just finished your book titles “Lilac Girls”. I didn’t want it to end. I sobbed for, carried thoughts of the characters and lingered within the story long after closing the book for the day. I read while on a stationary bike or elliptical machine at the gym. Yes, I can read very comprehensively while doing this. I didn’t want this story to end, yet knew it had to come to a final point for the book. I would like to see a continuation of their stories. I see you have a prequel telling the story of Caroline’s ancestral lineage. I will be reading this very soon! I also must commend and share my enthusiasm and gratitude to you for finding this story through your leisure. Then having the talent in telling the story of these admirable and astonishing women of history. They certainly lived in a time very distant from my lifetime and experiences. Yet now after reading this story, they have become part of my being through your craft. Thank you for sharing your talent with all of us having read your work. You are so welcome, Vivian! The prequel, Lost Roses, comes out next spring. Hope you enjoy it! Like so many others I had not heard of these brave Polish women who suffered such humiliation, agony and death. I grew up during WWII and have read many factual accounts and some historical fiction. But, never have I read something so compelling. I love a good mystery and usually read any book in a couple of days. However, this one I tried to savor-my son repeatedly told me to only read a couple of chapters at a time.I did make it last 4 days. In reading this wonderful book, my mind kept wandering back to the story my grandfather told me about his sister,my great aunt, in Hungary. Her family somehow survived the Nazi Occupation. When the Russians entered Hungary my great aunt was able to get a letter out to my grandfather saying that she and her family were going to to hide in their winery caves. He never heard from her again. So often I’ve wondered what happened to her and my cousins but have never been able to find out. I visited Hungary in the 80’s but as it was still communist controlled I was unable to find any information. Nationalism and divisiveness are now a creeping sickness that is invading America and Europe. As said earlier “those that do not remember history are doomed to repeat it”. Hope that those in power check out a few history books from the library. Dear Dolores, What an incredible story you have. I’m so happy you enjoyed the book and agree with your concerns about nationalism and divisiveness.Thank you for reaching out! Dear Ms Kelly. Thank you for your wonderful contribution to literature. I was overwhelmed by your book, Lilac Girls. Because I was diagnosed with PTSD and my mental and emotional is extremely important to me, I found this book extremely provocative. I have never, ever been able to understand mans’ inhumanity to man, and your book underscores this disease. Your book offers up another example of the indomitable will of the human spirit. Even though I could not read parts of your book because my PTSD response resulted in tremors, extreme anxiety, nightmares, etc., I did skim and read most of it. My curiosity was raised and I researched the Nazi doctors and staff involved and was startled to learn of the collusion of a Red Cross director who did nothing to rescue these women because he was an acquaintance of a German doctor at Ravensbruck. . .what a horrible twist of fate. Thank you for your diligent endeavors in bringing us this inspiring story. It was very brave of you to read the book, Theresa. I can only imagine the challenges of PTSD. Though it wasn’t a diagnosis back then Kasia and the other Rabbits certainly suffered from it as well. Thank you for reaching out with such kind thoughts. Just when I thought I had a reasonable handle on just how horrible the Nazis were, I listened to your book. I, too, have had such a struggle with man’s inhumanity to man. Thank you for bringing these stories of tragedy and triumph to light. It is on my book club’s reading list for 2018. You are so welcome, Joanne. I hope you have a good book club meeting–send me a picture of you all if you think of it…I love putting them on my book club page. Just finished Lilac Girls. A great read! Such atrocities by the Germans. Thanks for telling their inspiring story. You are so welcome, Martha! Thank you for your kind words. I just finished lilac girls while on vacation with my husband and was blown away. As a Jewish women I know all too well of the horrors of the Holocaust and while I knew about Ravensbruk, I didn’t really know about these particular experiments. Your book was a powerful, moving, and beautifully well written. Because of your book, I have spent time since finishing, researching and learning as much as I could on this horrible moment in history. Thank you for doing your part in getting the word out. The more we continue discussions the more we can make sure that this happens NEVER AGAIN. ? Thank you for your lovely thoughts, Marissa. I agree…never again! WOW! Read this in one nonstop sitting. I haven’t done that EVER in my life. Thank you for gifting us with this incredible, heart-breaking and inspiring story. I am in too much awe to say much else right now, other than THANK YOU for bringing their stories to life. So glad you enjoyed it! ? I just finished Lilac Girls, a truly memorable book. I was so torn as I followed the three main characters, Caroline, Kasia, and Herta. 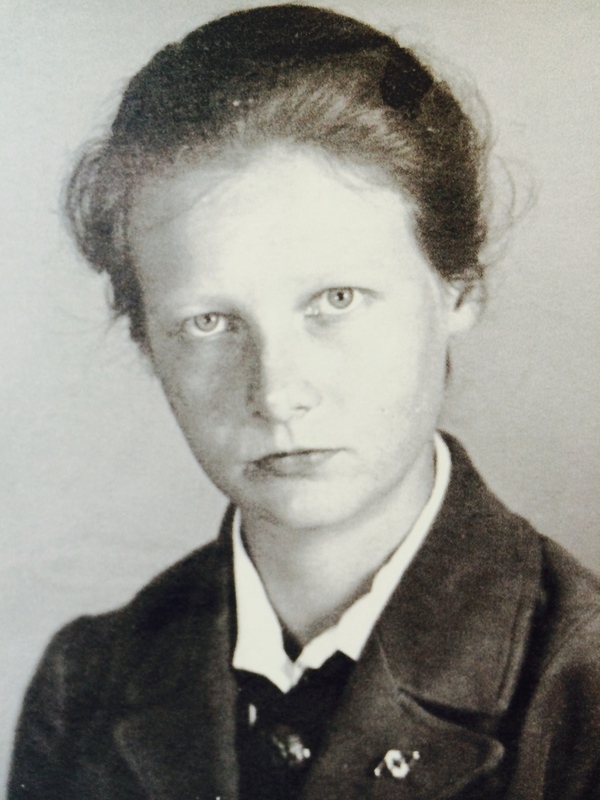 I found myself swinging form sympathy to horror and amazement at the resilience of Kasia and her family and comrades as they endured the unthinkable at the hands of Herta and the SS & Nazi machine. I remember traveling in Germany in the mid 1970’s and sitting by a well dressed gentleman with an English accent with a concentration camp tattoo on his arm. I immediately recognized it for what it was. I asked him his story and after he told me the whole story he said that by the war’s end only he had survived of all his family. He was then sent to England as an orphan where he was adopted. I asked him how he could stand to come back to Germany that had killed his family? Didn’t he hate Germany? He said that when he was free he decided he would not let the rest of his life be taken by what had happened . Therefore he had made peace with it in order to truly be free to live the rest of his life. …and he had. Now he had come back to say goodbye to the man ( now terminally ill) who had taken care to get him to England as a child. I thought of this story when I read your words the psychiatrist told Kasia in NYC ….to deal with her anger and accept sympathy from those around her in order to heal. Thanks you for a most moving story..
What a lovely story, Susan. Thank you for sharing it! Most of the Ravensbruck Ladies felt the same way. Previous postTime traveling to 1916 St. Petersburg to Research the Lilac Girls Prequel was Sheer Joy.